The Brooklyn Tech Triangle, which includes the neighborhoods of DUMBO, Downtown Brooklyn, and the Brooklyn Navy Yard area is becoming the City’s largest cluster of tech activity outside of Manhattan, with nearly 10% of the sector calling this area home. Individually, these neighborhoods have attracted the interest of innovative tenants in the last several years, especially in DUMBO, which has become a recognized tech hub. The challenge of nurturing this influx of innovation requires ensuring that the right kind of space and environment is available for tech firms, and both opportunities and talent are encouraged. However, a lack of appropriate office space and adequate job preparation, among other factors, threatens to stifle this growth and send companies to invest and hire elsewhere. 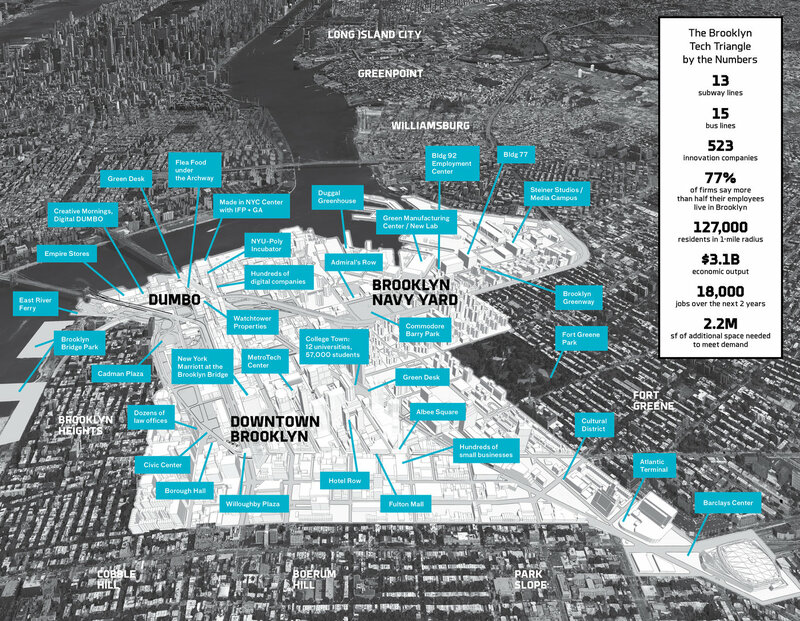 Led by the Downtown Brooklyn Partnership, the DUMBO Improvement District, and the Brooklyn Navy Yard Development Corporation, the Brooklyn Tech Triangle Strategic Plan seeks to address these challenges by providing a blueprint for nurturing the growth of this sector and ensuring New York can capitalize on the job creation of the industry. As part of a consultant team led by WXY Architecture + Urban Design, HR&A spearheaded the real estate and economic analysis supporting policy recommendations to foster the area’s tech sector growth. HR&A helped develop a working definition of the target tech and creative industry sectors, assessed the current status of tech and creative companies in the Tech Triangle area, and recommended changes in public and private real estate development and management policies. The team as a whole also considered workforce development, transportation, and open space and streetscape strategies to foster the growth of the technology and creative economy in the area. The final report focuses on actionable recommendations for implementation by both the public and private sectors, to nurture the growth of creative industries within the Tech Triangle while maximizing the employment benefits for local residents. The report describes five categories of recommendations to ensure that the Tech Triangle remains a world-class center for innovation and resources and the 2nd largest cluster of tech and creative companies for New York City: creating space for tech to grow, connecting Brooklyn’s educational institutions to the tech sector, improving physical connectivity across the district, improving the urban fabric of the Triangle, and marketing Triangle-created new technologies, while also bolstering the digital infrastructure of the area. Specific recommendations conceived and analyzed by HR&A included: a master lessee program to align tech tenants’ leasing preferences with traditional landlord financing requirements and a special innovation district to create more active space for the innovation economy in existing storage and warehouse buildings. As of January 2016, a number of the initiatives we described are underway, and the Tech Triangle is now home to 1,351 innovation companies and 17,302 employees, up from 1,107 and 11,967 in 2012, respectively. In November 2013, the New York chapter of the American Planning Association honored the Brooklyn Tech Triangle Strategic Plan with its annual award for Meritorious Achievement citing the ambitious scale of the plan to serve as a model for economic development in urban centers.